Band's semi-inactive fourth member plays new material in Baltimore as warm up for fundraising trip to Africa. 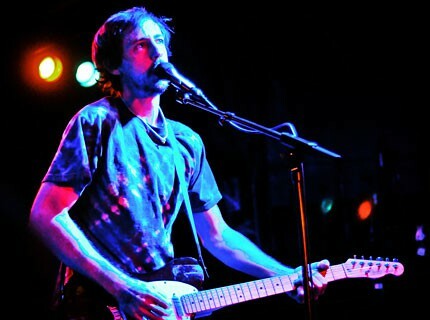 Baltimore’s Ottobar is a cozy space, its walls lacquered with black paint, yellowing punk posters, water stains, and rock history — the last of which made it an especially fitting venue for the barely-hyped solo debut of Maryland lad-done-good Josh Dibb, better known as Deacon, a founding member of Animal Collective. Deacon — who hasn’t been an active member of the band since 2006 — used the New Year’s Day gig as a test run for songs he’s been preparing for a limited edition CD release and a trip to Mali, both of which are part of his efforts to help abolish slavery in the African nation. So while Animal Collective’s 2009 opus, Merriweather Post Pavilion — SPIN’s Album of the Year — was a career-making effort, Deacon’s solo set Friday night offered a glimpse into an alternate reality where AC hadn’t blown up into the stratosphere: Only a few college-aged Animal Collective fans populated a room that also included Baltimore experimental music luminaries like Dan Deacon to Nautical Almanac noisenik Twig Harper. A skinny, plain-ish looking fellow sporting a tie-dye shirt and a de rigueur Brooklyn moustache, Deacon played by himself for a little less than half an hour, and looked a bit uncomfortable. Switching back and forth between a microphone and a small table of electronics, his material mixed rock guitar — at turns comfortably melodic, angrily dissonant, or prettily swelling — with canned beats and uneasy ebbs of electronic ambience. But five songs in, Deacon took an exciting turn into heavier, darker tones: The beats thumped deeply, while his pick ground into the strings, making a discordant din that infiltrated the background ambience like gravel spread into sand. Vocally, he eschewed friendlier vocal effects — which, frankly, made him sound awfully dude-from-Animal Collective — for a Morrissey-like croon. Like Bradford Cox’s Deerhunter, Deacon’s music feels heavily Xanaxed, and his lyrics veer in and out of intelligibility. The next audience to experience Deacon’s solo work will be a Malian crowd later this week. The rocker departed for Mali on January 2 — and is bringing along $25,000 in funds raised by Animal Collective fans and donated by the band’s former label, Paw Tracks. Those who donated $50 or more will receive a CD of music recorded by Deacon during his trip. To read more about Deacon’s journey, and his upcoming performance at that country’s Festival in the Desert later this week, click here.